There are few things more darling than a kitten in her first few weeks of life. She is tiny and frail and relies upon her mother for survival. Your kitten should grow exponentially, doubling her weight in the first week of her life. Sadly, not all kittens thrive. Your new baby may need a little help to start her off on the way to a healthy life. Kittens are born rather defenseless. They cannot see or hear, and their immune systems are dangerously undeveloped. They rely upon passive immunity, a strengthening of their immune system provided by colostrum, the first milk their mother will produce. Your nursing kitten should gain weight by nursing from her mother. 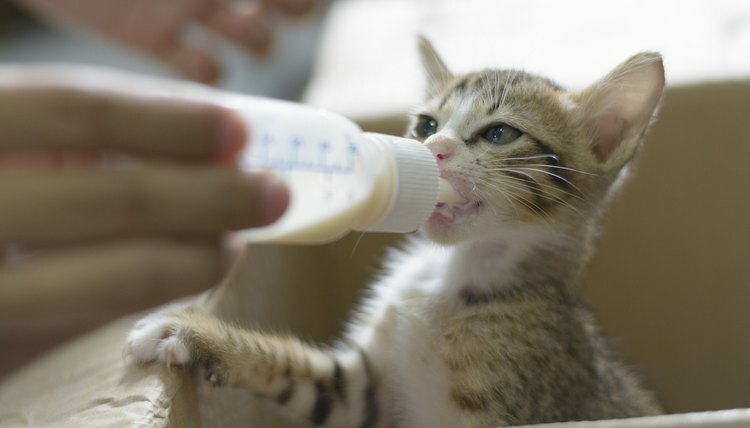 Occasionally, especially in the case of a large litter, or with a runt, your kitten may not get proper nutrition because she isn't getting enough milk. The best way to make sure your kitten is gaining weight is to make sure she is nursing properly. Observe the kittens to make sure each is latching on and nursing. If your kitten isn't nursing, or is an orphan, her survival will depend on your intervention. Occasionally, a mother cat may reject her offspring or not survive the birthing process. Should this happen, you may find yourself a surrogate mother to a newborn kitten, and will need to take action immediately. Contact your veterinarian for a milk replacement, such as Kitten Milk Replacer. Your veterinarian can provide a replacement and a specific feeding schedule. Follow the feeding schedule your vet provides, and obtain a small scale on which you can weigh your kitten. If your kitten fails to gain weight, loses weight, or appears to be declining, you should seek immediate veterinary care. It's important to remember that thriving isn't just about nutrition. While caring for your infant kitten, be sure to keep her warm and dry. If she is expending too much energy keeping herself warm, she could stop gaining weight and her health may decline. If your kitten fails to gain weight, it may not be a nutritional problem. Parasites are one of the leading causes of health issues in kittens. If your kitten develops diarrhea, a parasite may be the culprit. Coccidia, which can thrive and breed in your kitten's intestines, as well as worms, such as roundworm, can cause weight loss and declining health in your young kitten. Additional health concerns such as upper respiratory infections and fleas, may cause your kitten to lose weight, as her body fights off infection, or suffers the depletion caused by a flea infestation. Once your kitten reaches 3 weeks of age, you can begin giving her meat-based kitten food. Water down the food to help your kitten's young digestive system process her first solid meals. If your kitten fails to thrive, or begins to lose weight once she is no longer nursing or drinking the kitten milk replacer, she should see her veterinarian. He may recommend a high-calorie replacement gel. Your kitten needs three times the calories of an adult cat for the first year of her life. Choose a high-quality kitten food to make sure your young feline is getting the nutrition she needs.